Sgt. 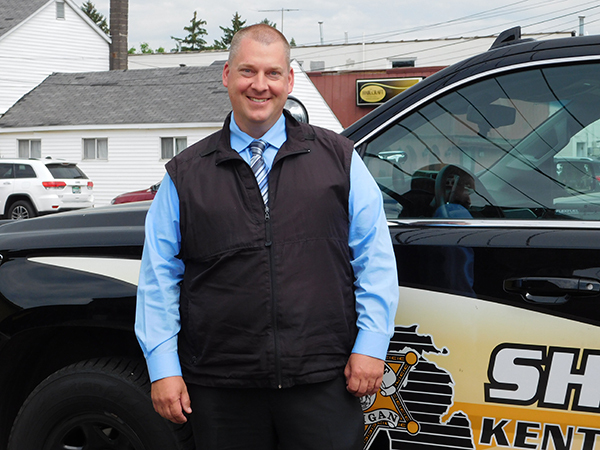 Jason Kelley, formerly supervisor of the Cedar Springs unit of the Kent County Sheriff Department, has taken on a new position in the investigative division. Post photo by J. Reed. When the Cedar Springs Police Department dissolved in 2014, and the Kent County Sheriff Department took over policing for the City of Cedar Springs in a unique partnership, many residents weren’t sure how smooth the transition would be, or what to expect. But there was one person working tirelessly behind the scenes to make sure it was everything residents expected and more—Sgt. Jason Kelley. Kelley has been in charge of the new Cedar Springs unit of the Kent County Sheriff Department for the last 3-1/2 years. As of this week, he took on a new assignment as Detective Sergeant with the investigative division. As far as accomplishments, he said he feels that he and the deputies have forged a good relationship between the Sheriff Dept. and the citizens of Cedar Springs. “We have a highly visible patrol, and we’ve made contact with community members that we might not have if we had not been as visible,” he said. Another accomplishment he’s been happy with is that of the placement of a school resource officer at Cedar Springs Public Schools. “That has been a great success,” noted Kelley. The original Cedar Springs officers that trained to be Sheriff Deputies have moved on to other sectors in the county, according to Kelley, and it was their own choice. There have also been other deputies who have served here since the transition that had ties to Cedar Springs such as Deputies Jason VanDyke, Todd Frank, and Mike Tanis. Tanis is now a detective at the north substation. Kelley said that of all the cases he’s been involved with here, one of the most memorable was the vandalism, theft, and recovery of the Timothy Brown monument. “It may not be the most significant, but it is probably the nearest and dearest to my heart because of the family and community emotions tied to it, and my ties to the veteran community,” he explained. Kelley said one of the most important things he’s learned from his assignment here is how important it is to have buy in and cooperation from the community. “We can’t do our job without community involvement. We know that already, but when you are closer to the community, you realize that even more so.” He said the Timothy Brown monument case was a good example of that. “When we put the word out, and you publish things in the paper that we are looking for someone, people give us tips. We get that community involvement.” He added that once they give the tip, it’s also important that community members will feel safe and confident that the officers will do their job. “Citizens really play a key role in law enforcement,” he said. Kelley grew up in Benzie County and graduated from Benzie Central High School. After graduation he joined the Navy and served on active duty for six years, and earned his degree in Criminal Justice. After leaving the Navy, he attended the Police Academy in Traverse City, and then served with the Benzie County Sheriff Department for two years, from 200-2002. He was with Rogers City Police Department from 2002-2003, and was hired by the Kent County Sheriff Department in January of 2003. While at the KCSD, he has worked road patrol out of the Central, North and South substations, had several assignments with the detective bureau including the burglary and theft unit, and served on the major case team. He was also a road patrol day shift supervisor, and road patrol night shift supervisor for the Central/North sector, before coming to Cedar Springs. Kelley was named Deputy of the year for 2014 for his success with the Cedar Springs transition, among other things. “Due to his outstanding performance, enthusiasm and work ethic, Sgt. Kelley was selected to be the Cedar Springs Unit supervisor and was instrumental in making this ‘Change of Command’ transition a huge success,” wrote Sheriff Larry Stelma at the time. Kelley has made a lot of friends in the community and will be missed by many. He has some mixed emotions of his own. “I’m sad to leave this assignment but excited for my new role in the investigative division,” he remarked. On behalf of the community of Cedar Springs, The Post wishes Sgt. Kelley well on his new assignment! Next week, we will introduce you to the new supervisor of the Cedar Springs unit, Sgt. Todd Probst.